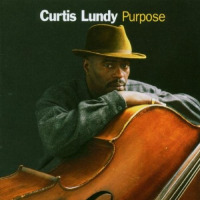 As if working a nightclub session in the wee hours of the morning, Curtis Lundy's quintet purrs with a smooth sound and a subtle, but forceful, rhythmic drive. The bassist was a student at Miami University in 1979 when Betty Carter "discovered" him and brought him to New York. Since then, he's had many opportunities to work clubs and concert halls in search of the right setting for creating mainstream jazz. Against All Odds, his previous album, and Purpose remind the listener that ours is a precious art that is preserved only through dedication. Jazz artists live with a purpose. Financial gain and celebrity are not the motivation; but artistic desire and creative freedom take over instead. To paraphrase a popular song, "Momma, don't let your daughters grow up to marry jazz guys." They'll not be rich and famous, but they'll be happy. Lundy's session remains settled firmly into the wee hours mood throughout. Vibraphone, tenor saxophone and piano share the front line melodies, as Lundy prefers to lead from the back seat. It's a standard session, but composed of original compositions. "Pas de Trois," the lone exception, contains a stirring bass solo that demonstrates Lundy's highly emotional lyricism. Mainstream jazz is in good hands. Track Listing: Snake Eyes; Shape Shifting; A Walk in Serendipity; Love Transforms; Two Heartbeats; Oveida; Pas de Trois; Blues for J.A. ; Carmen. Personnel: Curtis Lundy-bass; John Hicks, Anthony Wonsey-piano; Mark Shim-tenor saxophone; Steve Nelson-vibraphone; Billy Hart-drums.